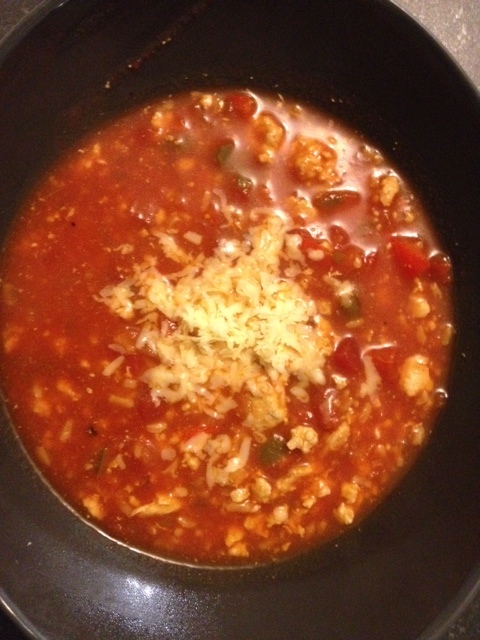 Stuffed Pepper Soup | Om nom nom! As much as I hate it, it is soup and stew weather again. I first saw this on Skinnytaste and liked the idea, though thought it a bit bland. Turns out there are a lot of recipes for stuffed pepper soup out there, and this is a mish mash of all of them – forgive the vague measurements. This was great – I wouldn’t change anything other than potentially lowering the amount of stock I use next time and upping the number of peppers. Definitely one to add to the cold-weather line up! Head oil over medium-high heat, add ground turkey and season with salt, pepper, and allspice. Brown for 3-5 minutes, then add crushed garlic and cook another 3-5 minutes. Add onion, peppers, and bay leaves and cook until tender. Add stock and tomatoes and bring to a boil. Simmer for 10 minutes or so, then add rice (if using minute rice). Otherwise, cook rice separately, simmer for another 20 minutes and add rice at the end. Sprinkle with your favorite shredded cheese (we used very sharp cheddar). This could probably be done in a slow cooker as well – might try that next time.